Gustav Stickley creator of American craftsman furniture and the Craftsman magazine. Gustav Stickley was a hardworking, dedicated man, and achieved success in the early 1900s as the leader of the Arts & Crafts Movement in America. In 1891, the brothers Albert and Leopold Stickley founded the original Stickley Brothers Company in Grand Rapids, Michigan. They also established operations in England which exposed them to the European arts and crafts movement that proved so influential. They manufactured simple yet finely crafted furniture in the arts and crafts style for the European market, but soon were also importing these styles into the United States as U.S. consumers developed a more sophisticated taste for well designed and well crafted furniture. Gustav Stickley, was born in Wisconsin, the son of German immigrants. He began working with his father as a stone mason, and gained a sound appreciation for craftmanship. In 1870, Gustav began working in his uncle Jacob Schlaeger’s chair factory in Brandt, Pennsylvania, not leaving until 1884 to establish his own business with his two brothers Charles and Albert in Binghamton, NY. In 1897 during a trip to England, Gustav was inspired by British reformers, John Ruskin and William Morris and subsequently created a new line of handcrafted furniture based on honesty and simplicity. Stickley returned to America and established United Crafts which later became known as Craftsman Workshops. In 1898 he opened United Crafts in Eastwood, New York where he introduced his Craftsman line which by 1900, reflected an indigenous American Arts & Crafts philosophy. His quarter sawn oak furniture incorporated overt structural details such as tenon-and-key construction, chamfered boards, and exposed tenons. His recti-linear shapes were free of any excessive ornamentation except for what occurred naturally in the construction, design and material. This revealed not only the excellent craftsmanship that went into each piece, but also the beauty, simplicity, and utility of the design. Gustav occasionally decorated his tabletops with Grueby tile and often used Grueby vases in his displays. His trip to the 1900 Paris Exhibition confirmed his bias against reproductions, but while taking his philosophical inspiration from the European Arts & Crafts movement, Stickley took his artistic inspiration from America. Gustav Stickley always felt that art should represent the everyday lives of everyday people. 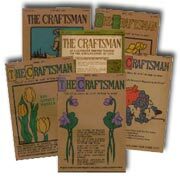 In 1901, Gustav Stickley published The Craftsman magazine. A chronicle of the arts and crafts movement and its design principles, the Craftsman promoted simple honest style in home design, decorating, and even gardening. It was to become the best known and most widely read publication of arts and crafts design. In 1903, Harvey Ellis was hired to write for The Craftsman, but soon began working directly with Gustav to design a wider variety of the simple, finely crafted furniture and accessories for which Stickley Brothers is still known today. Where Gustav Stickley’s designs were somewhat more substantial, Ellis retained the simplicity and fine craftsmanship while evolving a more comfortable, elegant style reminiscent of the Scottish designer Charles Rennie Mackintosh. 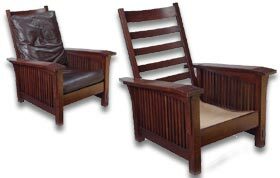 In 1915, however, as with most arts and crafts productions, the labor intensity and limited market of Stickley designs coupled with the approach of World War I led to the bankruptcy of the company. At that point, Gustav’s younger brothers Leopold and John George assumed Gustav’s debts, took over his workshops and formed the L & JG Stickley Company. 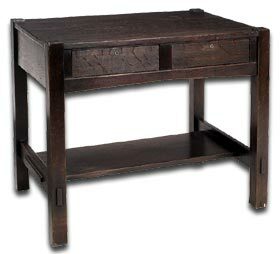 The L & JG Stickley Company followed the same principles of furniture design pioneered by Gustav. But they also fostered a greater sense of design freedom among their craftsmen and this led to a more diverse production. By this time, many U.S. manufacturers were copying the Stickley designs, creating an entire industry around the mission style furniture that Stickley’s work had come to be known as. While Stickley furniture always had a degree of machine involvement in creating the design, Gustav and his brothers really looked to machining more as a precursor for hand crafted details. This balance provided the foundation of the American arts and crafts movement. Where machines were used to a limited but productive degree in the furniture designs, bringing down the cost sufficiently to open up the market to the middle classes. This is a distinction unique to the American movement, for in England any dependence whatsoever on machinery was shunned and made English arts and crafts designs too costly for most people. Designs were simple yet elegant, free from ornamentation and allowing the craftsmanship itself to show through in the structural elements such as mortise & tenon and tongue & groove joints in the furniture. The Stickleys always appreciated the inherent beauty of wood and leather and never felt the need to embellish the cleanliness of their designs.